Modern Humans, or Homo Sapiens, are the last of our species – despite the fact that there are over 7 billion of us. There have been several other ‘homonids’ that walked this planet. But, I’m not talking about our ‘predecessors.’ What I’m talking about is the other human species that lived side by side with us. One such species was Homo Floresiensis (Yes, I can finally spell that without Googling it!). This species of hominid stood barely over 1 meter tall, and existed until about 12,000 years ago. So, we have the humans on the smaller end of the spectrum, but how about on the other end? Proof of Giant Humans Found? Although there have been countless stories of giant human skeletons found, for some reason or another, there seem to be no real concrete facts. Many of the stories are dismissed as fraud, while many others simply seem to fade away before the general public has a chance to make an informed decision. Well, aside from just skeletons or human remains, there are many other interesting items that may point in the direction of Giants in the land. 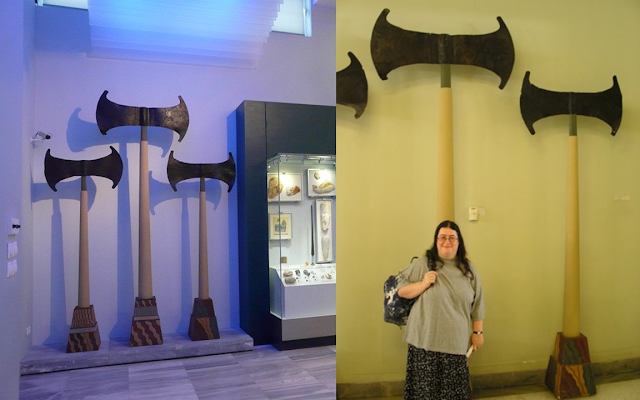 These three remarkable double-axes are showcased at the Herakleion Archaeological Museum in Greece. The museum is best known for its Minoan art and collection of Minoan artifacts. Such artifacts include these formidable looking axes. 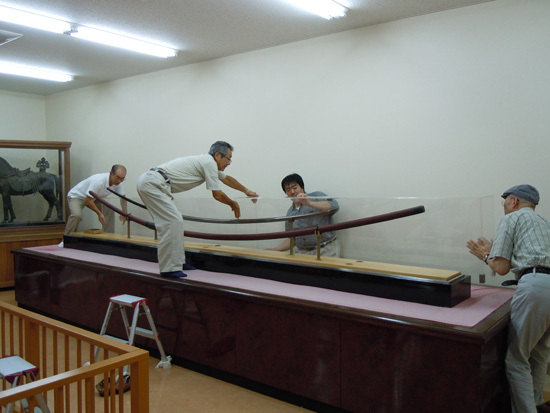 In the photo above, you can see just how large they are when compared with an adult human. To wield an axe this size, a person would need to be at least 13 feet tall. According to scholars, these axes were used for decorative or ceremonial purposes rather than in battle. 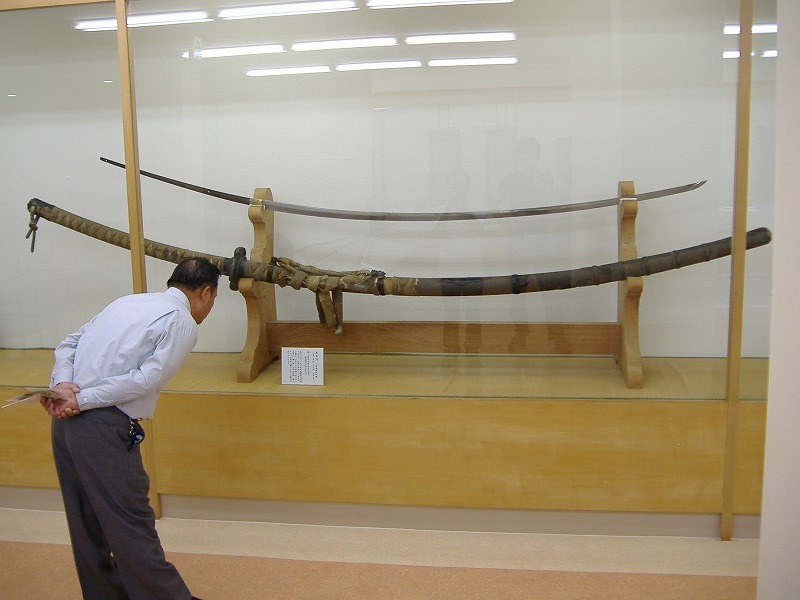 This 15th century weapon was forged from a single piece of steel, and is now displayed in the Kibitsu shrine. Just because it’s awesome, here’s a picture of “Babydoll” vs Giant Samurai in Sucker Punch. If you want, you can watch the whole fight scene here. A buried axe was discovered by a farmer and his brother in law while they were out planting pine trees. Archaeologists later uncovered 3 more in the area, which turned out to be dated to the Bronze Age. 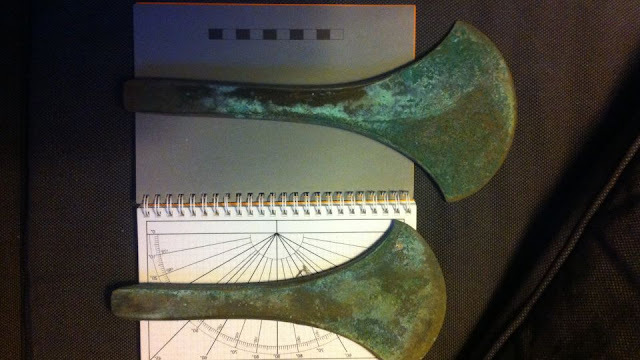 The axes are about twice the size and weight of the usual axes found. This suggests that whoever used these axes may have been larger than average as well. To be honest, I’m a little iffy about this one, as every article on the net seems to literally be cut and pasted from the next. This just means they are repeating each other rather than supporting each other – hence I left it for last. The report is supposedly based on a paper called “A Report On Gigantic Implements Found In South Morocco,” although information about the actual paper seems to be nowhere on the internet. According to the story, French Captain Lafanechere uncovered an arsenal of over 500 hunting weapons of abnormally large size and weight – a weight that would be 20 times more than an average man could conveniently lift. Aside from these things mentioned above, there have been numerous other findings of objects and artifacts that seem slightly out of place (size.) -- Not to mention a whole host of giant versions of modern-day animals. Were all of these items abnormally large just for decoration, or did someone actually use them? And if so, who was this mysterious race of giant humans that seems to have simply vanished from the face of the earth? All signs point to a larger breed of homonids. Giants, then. No doubt to me.